So, we currently have a post for just how awesome Inside Out is. Go there and gush, please. I’m starting a new post about it because I have something specific I want to discuss about the movie. and her Mom’s are all female? And it looks like the teacher’s are all female, too? And you can’t tell with the dog and cat because they’re a dog and a cat, and you can’t really tell with the boy who likes her because they’re all running around, but the girl in her class’s emotions are all female. Why? Thoughts? (Other than the obvious: since these were going to be the major characters in the movie, they needed a mix of genders.) I did like that they didn’t make each emotion specifically gendered: ie, all angers male and all disgusts female, across the board. Our discussion revolved around the fact that emotions are not inherently gendered. We thought that maybe everyone has a different mix: that for some people all the emotions are one gender, but for some people they are varying degrees of mixed genders, and that it just depends on the person which emotions would be male and which would be female. There are probably girls whose sadness is male and whose anger is female, for example. He is nine, so we didn’t really get any deeper into it than that, but I think it was a really good place for him to start thinking about gender in a different way, as well as about how his emotions drive him and how he processes them. 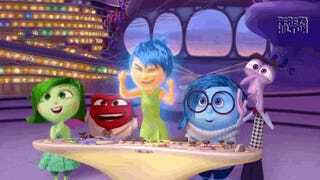 We also found it interesting that in the mom, Sadness is the leading emotion, while in the dad it’s Anger. Can’t remember who they were in the other characters we see inside of. It really was a great representation of how our emotions work and interact and the creators had clearly done their psychology homework.